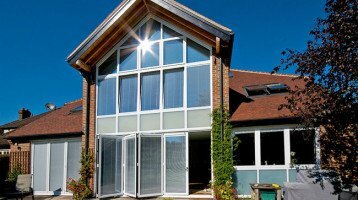 Cheam Windows have been installing Bi folding Doors in Surrey for many years. Een before they became the lifestyle and must have home improvement product they are today. Our commitment to giving our customers only the very highest quality products extends very much to our Bi folding Doors. We provide what the industry now agrees to be the market leading Aluminium Sliding Folding Door on the market. The many unique features include the guarantee offered on the product. The aluminium Bi folding Doors Cheam Windows offers to its customers are the only ones in the entire home improvement industry with a 20 year guarantee. Fact. No other bifolding door product anywhere offers this type of guarantee on a bifolding door. Therefore, when your bi-folding doors are installed, they will come with an extra 20 year guarantee from the designer and maker of the product. 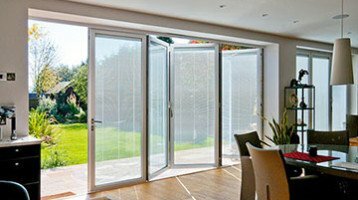 Cheam Windows were one of the first companies to provide the Origin Bifolding Door. 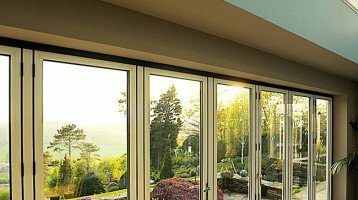 We are now one of the longest established Origin Approved Installers in Surrey of the Origin bi-folding door. Each door has a one time serial number just for you. When your door was made. Our Bi Folding Doors are made of aluminium. This is agreed by most architects and industry professionals as being the most suitable material for bifolding doors. Cheam Windows bi-folding doors are all custom made in the UK. They are made one by one to suit your home and how you will actually use the doors. And with a wide choice of hardware options. Our bi-folding doors have been designed from the ground up, not a modification of a swing door to create a sliding folding door like some other products. Added to this high quality made to order product is the unrivalled craftsmanship and performance guarantees that comes with it. The bi-folding doors you will view at any of our Surrey showrooms have the highest quality parts and running gear. The manufacturing processes and methods that go to create our sliding folding doors are the very latest. And use only top quality materials. It is a mix of all these factors, completed by the many years experience of Cheam Windows in supplying and installing bi-folding doors that enables us to offer a product with a 20 year guarantee. We believe from our many years trading and with thousands of happy customers that our aluminium bi-folding doors are the best you can buy. 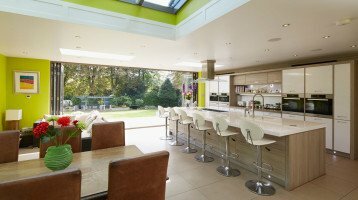 You can view any of our bifolding doors in our Surrey Showrooms.